Pork and Mushroom Soup | Is Life a Recipe? The usual situation happens. We have loads of bits in the fridge, it’s a rainy day, and Baby Jude is fast asleep. A decision was made to stay indoors, but what to eat for dinner. Daddy gets creative and comes up with this cracking, Pork and Mushroom Soup. How good does that look, crackling and all. Oh yes! A quick scoot to Cold Storage to get a couple of bits and hey presto we had a really nice noodle soup. This will make 3 litres of Pork and Mushroom Soup, so more than enough for 4-6 people easily. There is an addition that I mad for Ollie and I, which was a chili addition. On my balcony garden, I have these beauties growing at the moment. 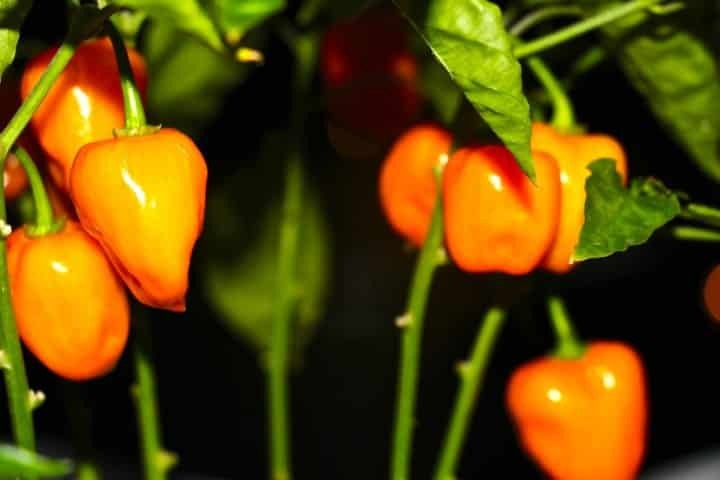 Habaneros, which are renowned as one of the hottest chili families. you can get. If you want to spice up your version of Pork and Mushroom Soup, simply add some of this in to the soup. Give it all a little stir to make sure the sugar has dissolved and set aside. Add all these to your soup pot and set aside. 2-3 tables spoons lime juice. Heat your wok and add either some goose fat (as I did) or oil. 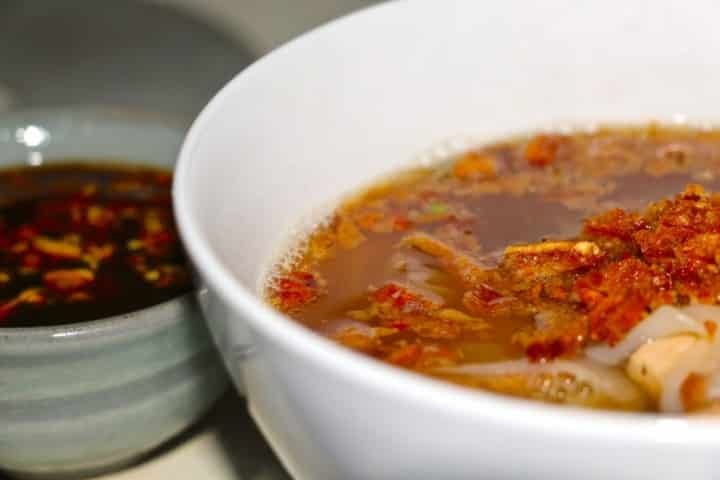 Whack in all the ingredients above and fry until the pork is cooked through – you’ll smell a delicious fragrance to this as the lime and lemon grass infuse. Really really nice. What do you do with this – simply pour it all, fat included, in to the soup stock. The crackling I chopped really finely, almost to a crunchy ‘dust’, as this is the soup dressing. Spoon in to soup bowls ensuring everyone gets a good balance of noodle, the 2 types of pork, the greens and mushrooms. Ladle on the soup. Finish it off with a sprinkling of the pork crunchy ‘dust’. Serve it with the Bum Burner dip for those that dare. It was a big thumbs up all round for this one folks – twas indeed a winner! The delicious Pork and Mushroom Soup – ENJOY!!! No Replies to "Pork and Mushroom Soup"